Council contractors have been busy in Axedale and Heathcote on sections of the trail that travel through the towns. Once upon a time the O’Keefe Rail Trail stopped at the Axedale cemetery. Not any more! Now you can ride all the way from the Bendigo Creek to the Campaspe River on an off-road trail. 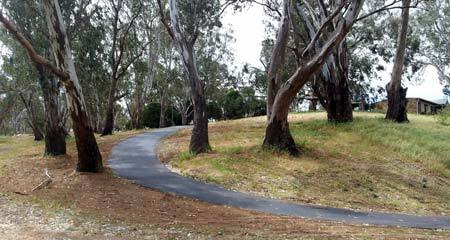 The trail now takes you across Crows Road and winds its way through the town to finish at the Campaspe River Reserve. Poetry in a path: the new off-road trail takes you right through Axedale to the Campaspe River. It’s even sealed from Shadforth St through to the river. Once they’d finished at Axedale, the contractors packed up and moved south to Heathcote where a combination of gravel and sealed path will run for approx. 3.2 km between Speed Street and Pink Cliffs Road is now under construction. Talk about getting the trail from Axedale to Heathcote is all very well, but actually seeing a bobcat at work is getting the residents excited. We’re also excited – it’s the first bit of new trail beyond Axedale since the first section of trail was opened in the early 1990s. Riding all the way to Heathcote on the trail is a step closer with the start of trail building in the township itself. Here’s a sketch of where the trail is going through Heathcote.